Indiana Needs More Dental Assistants. 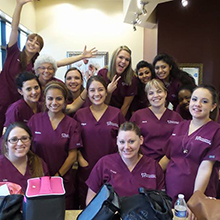 The American Institute of Dental Assisting is unique among Indiana dental assisting schools. The curriculum is established by licensed Indiana dentist Dr. Robert J. Ueber, who brings over 30 years of experience in the field. AIDA teaches you all the need-to-know facts and skills in an actual clinical environment and our students assist real doctors treating real patients in a real dental facility. The kicker? 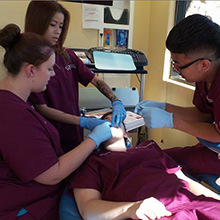 The course work is available evenings and weekends to allow students to continue with their present employment or family obligations while studying to become an Indiana dental assistant. 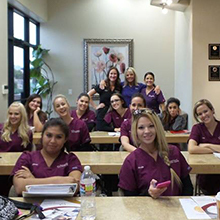 To receive more information on a career in Dental Assisting in Indiana and to explore whether American Institute of Dental Assisting is a good fit for you, fill out the form on this page or call (260) 466-8260 to speak with a friendly and knowledgeable AIDA Admissions Adviser right away. I really enjoyed coming to this school. It was worth coming every Friday. All of the instructors were awesome and really helpful when I needed the help. I’m going to miss coming up here. Being able to work on actual patients was a lot of fun and I learned a lot doing that. Indiana Department of Workforce Development.